As a writer, programmer, and maker of things, I keep myself abreast of the various developments in copyright law, and the evolving media landscape. The past decade has been a mix of amazing progress (powerful cheap/free creative tools that remove the barriers to entry), and horrifying regression (the abuse of copyright to support outmoded businesses at the cost of culture). When we’re honest, most writers will admit that our work is not entirely ours. We don’t invent our stories out of nothing. The truth is, we make them out of what’s come before and what surrounds us every day: the world we live in, people we know, stories we’ve read and images we’ve seen. We swim in a deep ocean of culture, and in a very real sense, everything we make is made from that vast, shared sea. We are part of it, just as we are part of the world in which we live. If we treat that ecosystem as nothing more than raw materials to be torn up, exploited and sold in the marketplace, then sooner or later the whole system will fall apart. And if we draw water from the shared ocean — as all writers do — we must also learn to give something back. The relationship between a writer and their work is vitally important and must be respected. But we must also respect the countless other relationships that form around our stories and ideas: those who read them, share them and respond by making something new. It’s been a long time since I’ve blogged links and/or articles, (I usually just put the links in my del.icio.us feed) but I thought that this was particularly noteworthy, because it fairly accurately articulates my own feelings about writing, art, and culture in general. 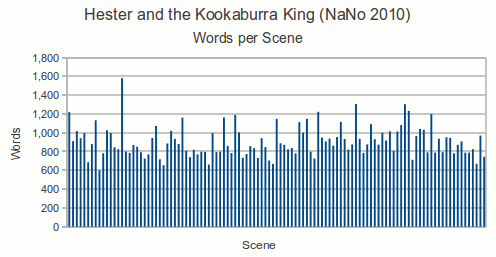 NaNoWriMo is over, I decided to take my 550 kB text file manuscript of Hester and the Kookaburra King (which I’ve dubbed Draft 0) and format it for manual editing. It took an hour in OpenOffice Writer, and I ended up with 430 double spaced pages. That’s almost a whole ream of paper. It measures two inches thick. That’s right, that’s two inches of solid paper. Maybe not so green, but for the first draft I just have to edit on paper with a red pen. P.S. In the meantime I’m already brainstorming the next stories, I’m thinking three novels (everyone loves a good trilogy) with short stories in between for the Guineawick Tales canon. One thing at a time. It’s finally December, and with National Novel Writing Month over, I thought it would be fun to put up some statistics about how the month went for me. 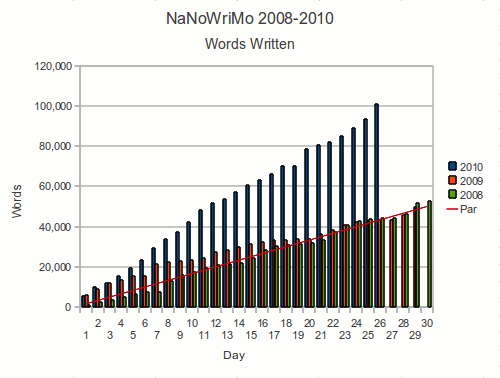 Let’s look at those word counts! In addition to the text in the scenes themselves, there were 231 words of titling in the story. 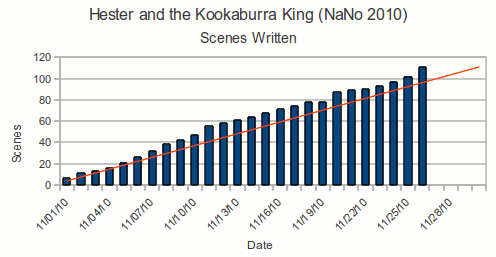 Just for comparison’s sake, I’ve whipped up these charts to show how well I did my first two years doing NaNoWriMo. 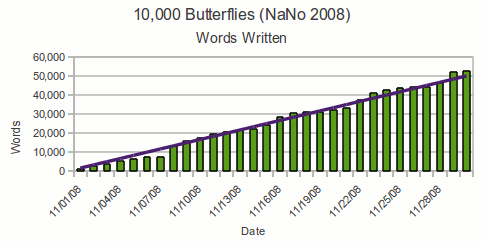 I had a lot of distractions in 2009, but ended up hitting 50,003 words, just over the finish line. 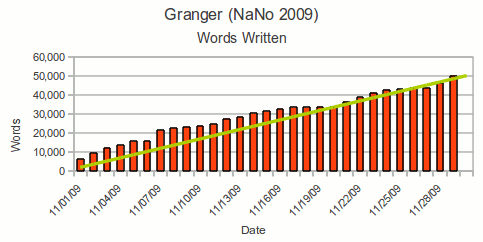 My first year for NaNoWriMo, and I got 52,644 words out of head and into that text file. And because I couldn’t resist, here’s all three years side by side. Eventually I’ll get around to posting a more qualitative postmortem for this year’s novel writing adventure. So overall that’s 689 hyphenated “extra” words, which I think is statistically insignificant enough to ignore. Since I don’t have the “real” numbers for each day, there’s nothing really I can do about it now. Anyway, onwards!